5 Steps to Bird Feeding Mastery! Video: Choose a Nest Box! Buy 3 Stackables for $14.97 and Get a FREE Feeder ($9 Value). It doesn’t take a lot of effort... or a lot of money to get started feeding the birds. With our Flying Start™ Combo, you get everything you need. 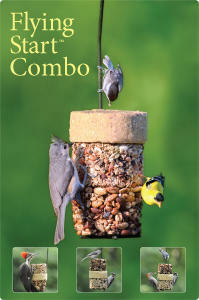 It’s quick, easy to hang and includes the foods all the birds in your backyard will love.